Grebe is the common name for any of the swimming and diving birds comprising the family Podicipedidae, characterized by a pointed bill, short, narrow wings, large feet placed far back on the body, a vestigial tail, and toes that are individually webbed. Podicipedidae is the only extant family in the order Podicipediformes. Grebes are widely distributed around the world in temperate, tropical, and often subarctic regions. While freshwater birds, some of species visit the sea when migrating and in winter. They are awkward on land and generally poor flyers. Grebes play an important role in food chains, consuming fish, crabs, and crustaceans, and being consumed by various mammals (raccoons), birds (gulls), and reptiles (water snakes). 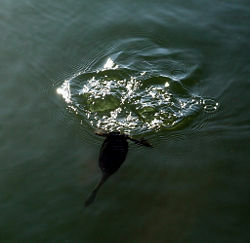 Their unique forms and behaviors add to the aesthetic beauty of the aquatic environment for humans although some human activities, such as change of the wetland habitat (draining, dredging, etc.) and pollution, threaten populations of grebes. The Podicipediformes order contains only a single family, the Podicipedidae, containing 22 species of grebes in 6 extant genera. Grebes are small to medium-large birds, with a short and stubby body. Extant species range in size from the least grebe, at 120 grams (4.3 ounces) and 23.5 centimeters (9.3 inches), to the great grebe, at 1.7 kilograms (3.8 pounds) and 71 centimeters (28 inches). The feet are always large, with broad lobes on the toes and small webs connecting the front three toes. The hind toe also has a small lobe. Recent experimental work has shown that these lobes work like the hydrofoil blades of a propeller (Fjeldså 1991). Curiously, the same mechanism apparently arose independently in the extinct Cretaceous-age Hesperornithiformes, which are totally unrelated birds. The large, webbed feet help them to be excellent divers. However, they have their feet placed far back on the body and are awkward on land. They can run for a short distance, but often fall over. Grebes have narrow wings. While most can fly, some species are reluctant to fly and two South American species are completely flightless (Fjeldså 1991). However, the North American and Eurasian species are all, of necessity, migratory over much or all of their ranges, and those species that winter at sea are also seen regularly in flight. Even the small freshwater pied-billed grebe of North America has occurred as a transatlantic vagrant to Europe on more than 30 occasions. Bills vary from short and thick to long and pointed, depending on the diet, which ranges from fish to freshwater insects and crustaceans. In the non-breeding season, grebes are plain-colored in dark browns and whites. However, most have ornate and distinctive breeding plumages, often developing chestnut markings on the head area, and perform elaborate display rituals (Fjeldså 1991). The young, particularly those of the Podiceps genus, are often striped and retain some of their juvenile plumage even after reaching full size. When preening, grebes eat their own feathers, and feed them to their young. The function of this behavior is uncertain but it is believed to assist with pellet formation and to reduce their vulnerability to gastric parasites. Grebes make floating nests of plant material concealed among reeds on the surface of the water. The young are precocial, and able to swim from birth (Fjeldså 1991). Grebes respond to danger by diving rather than flying, and are in any case much less wary than ducks. The grebes are a radically distinct group of birds as regards their anatomy. Accordingly, they were at first believed to be related to the loons, which are also foot-propelled diving birds. However, as recently as the 1930s (Stolpe 1935), this was determined to be an example of convergent evolution by the strong selective forces encountered by unrelated birds sharing the same lifestyle at different times and in different habitat. The cladistics vs. phenetics debate of the mid-twentieth century revived scientific interest in generalizing comparisons. As a consequence, the discredited grebe-loon link was discussed again. This even went as far as proposing monophyly for grebes, loons, and the toothed Hesperornithiformes (Cracraft, 1982). In retrospect, the scientific value of the debate lies more in providing examples that a cladistic methodology is not incompatible with an overall phenetical scientific doctrine, and that thus, simply because some study "uses cladistics," it does not guarantee superior results. Molecular studies such as DNA-DNA hybridization (Sibley & Ahlquist, 1990) and sequence analyses fail to resolve the relationships of grebes properly due to insufficient resolution in the former and long-branch attraction in the latter. Still—actually because of this—they do confirm that these birds form a fairly ancient evolutionary lineage (or possibly one that was subject to selective pressures down to the molecular level even), and they support the non-relatedness of loons and grebes. However, because of the recent improvements in sequencing technology, the question of the taxonomy of grebes appears to be finding some resolution. A recent phylogenomic study of the deep evolutionary relationships in birds shows that grebes are most closely related to flamingos. By collecting a large DNA sequence data bank, scientists were able to address the phylogenomic relationships from 171 species that represented all major passerine clades, all but three nonpasserine families, and two crocodile outgroups. All major extant groups were represented in this study, where they examined ~32 kilobases of aligned nuclear DNA sequences from 19 different loci for the 169 bird species plus the two crocodile outgroups (Hackett et al. 2008). This study validates earlier proposals of this relationship that have generally been ignored, even though careful analyses of morphological characters (i.e., excluding known homoplasies) and molecular data had suggested that this relationship was the most promising hypothesis to date. 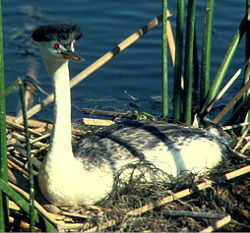 In addition, it was shown that the Anaticola bird lice shared by flamingos and waterfowl, which were at one time used to support a close relationship between the latter two (which is now deemed incorrect), are actually closely related to the grebes' Aquanirmus lice and almost certainly switched hosts from flamingos to waterfowl, not the other way around as it was usually assumed (Johnson et al. 2006). The Late Cretaceous (Berriasian, around 143 million years ago) genus Eurolimnornis from Romania was initially believed to be a grebe. If it is indeed related to this lineage, it must represent a most basal form, as it almost certainly predates any grebe-flamingo split. On the other hand, the single bone fragment assigned to this taxon is not very diagnostic and may not be of a bird at all (Benton et al. 1997). Telmatornis from the Navesink Formation—also Late Cretaceous—is traditionally allied with the Charadriiformes and/or Gruiformes.. However, a cladistic analysis of the forelimb skeleton (Varricchio 2002) found it highly similar to the great crested grebe and unlike the painted buttonquail (now known to be a basal charadriiform lineage), the black-necked stilt (a more advanced charadriiform), or the limpkin (a member of the Grui suborder of Gruiformes), namely in that its dorsal condyle of the humerus was not angled at 20°–30° away from long axis of the humerus. The analysis did not result in a phylogenetic pattern but rather grouped some birds with similar wing shapes together while others stood separate. It is thus unknown whether this apparent similarity to grebes represents an evolutionary relationship, or whether Telmatornis simply had a wing similar to that of grebes and moved it like they do. True grebes suddenly appear in the fossil record in the Late Oligocene or Early Miocene, around 23 to 25 million years ago (mya). While there are a few prehistoric genera that are now completely extinct, Thiornis (Late Miocene -? Early Pliocene of Libros, Spain) and Pliolymbus (Late Pliocene of USA - Early? Pleistocene of Chapala, Mexico) date from a time when most if not all extant genera were already present. Only the Early Miocene Miobaptus from Czechoslovakia might be somewhat closer to the ancestral grebes, but more probably belongs to an extinct lineage. Indeed, Miobaptus is rivaled or even exceeded in age by a species of the modern genus Podiceps. Benton, M. J., E. Cook, D. Grigorescu, E. Popa, and E. Tallódi. 1997. Dinosaurs and other tetrapods in an Early Cretaceous bauxite-filled fissure, northwestern Romania. Palaeogeography, Palaeoclimatology, Palaeoecology 130: 275-292. Retrieved December 31, 2008. Cracraft, J. 1982. Phylogenetic relationships and monophyly of loons, grebes, and hesperornithiform birds, with comments on the early history of birds. Systematic Zoology 31: 35-56. Retrieved December 31, 2008. Fjeldså, J. 1991. In J. Forshaw, Encyclopaedia of Animals: Birds. London: Merehurst Press. ISBN 1853911860. Hackett, S. J., R. T. Kimball, S. Reddy, R. C. K. Bowie, E. L. Braun, M. J. Braun, J. L. Chojnowski, A. Cox, K. Han, J. Harshman, G. J. Huddleston, B. D. Marks, K. J. Miglia, W. S. Moore, F. H. Sheldon, D. W. Steadman, C. C. Witt, and Y. Tamaki. 2008. A phylogenomic study of birds reveals their evolutionary history. Science 320: 1763-1768. Retrieved December 31, 2008. Jehl, J. R. 1967. Pleistocene birds from Fossil Lake, Oregon. Condor 69(1): 24-27. Retrieved December 31, 2008. Johnson, K. P., M. Kennedy, and K. G. McCracken. 2006. Reinterpreting the origins of flamingo lice: Cospeciation or host-switching? Biol. Lett. 2: 275–278. Retrieved December 31, 2008. Konter, A. 2001. Grebes of Our World: Visiting All Species on 5 Continents. Barcelona: Lynx Edicions. ISBN 8487334334. Murray, B. G. 1967. Grebes from the Late Pliocene of North America. Condor 69(3): 277-288. Retrieved December 31, 2008. Ogilvie, M., and C. Rose. 2003. Grebes of the World. Uxbridge, England: Bruce Coleman Books. ISBN 1872842038. Sibley, C. G., and B. L. Monroe. 1990. Distribution and Taxonomy of the Birds of the World: A Study in Molecular Evolution. New Haven, CT: Yale University Press. ISBN 0300049692. Stolpe, M. 1935. Colymbus, Hesperornis, Podiceps: Ein Vergleich ihrer hinteren Extremität. J. Ornithol. 80(1): 161-247. [Article in German] Retrieved December 31, 2008. Varricchio, D. J. 2002. A new bird from the Upper Cretaceous Two Medicine Formation of Montana. Canadian Journal of Earth Sciences 39(1): 19-26. Retrieved December 31, 2008. Wetmore, A. 1933. Pliocene bird remains from Idaho. Smithsonian Miscellaneous Collections 87: 1-12. All links retrieved January 14, 2013. This page was last modified on 14 July 2017, at 23:09.